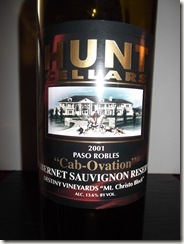 Hunt Cellars-Cab-Ovation-Cabernet Sauvignon-Reserve-Destiny Vineyards-Mt. 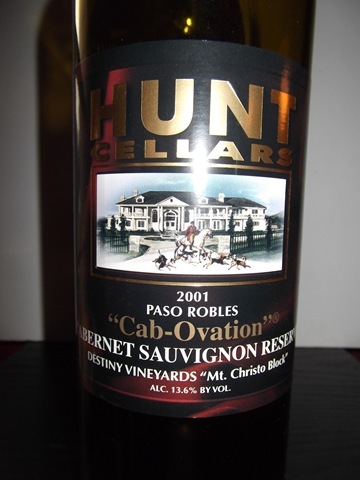 Christo Block-Paso Robles-California-2001-13.6% Alcohol-$29.98-A nose of black cherry and spices, dark garnet in color. 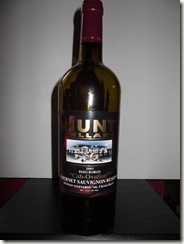 A smooth, full bodied Cab, with currants, wild cherries, vanilla and spice finish, there is some bottle variation where one bottle is more Bordeaux like and the next is bolder, drink now as wine is past it’s peak. 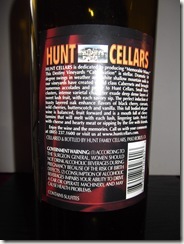 NR CR-90 Good with steak, chicken, pasta. 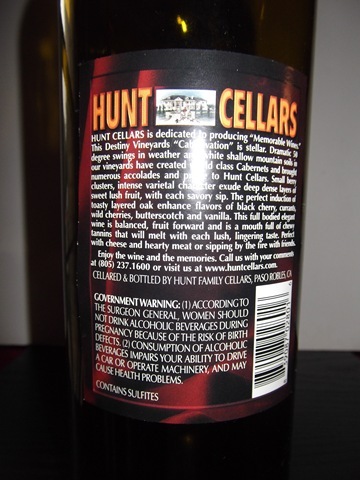 Bodegas Sierra Salinas, S.L.-Puerto Salinas-Monastrell-Garnacha-Cabernet Sauvignon- Alicante-Spain-14.5% Alcohol-$14.98-A nose of dark fruit and spice, dark purple in color. 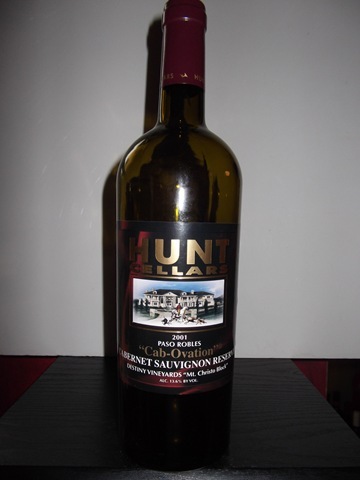 A medium bodied red, with blackberry, cherry, and spice on finish, good QPR. RP-92 CR-87 Good with meats, chicken, pasta.